This is the first French edition of The Great Taos Bank Robbery and Other Indian Country Affairs. This 1993 edition was published by Rivages/Noir in Paris France. Tony Hillerman's original English text was translated into French by Danièle and Pierre Bondil. 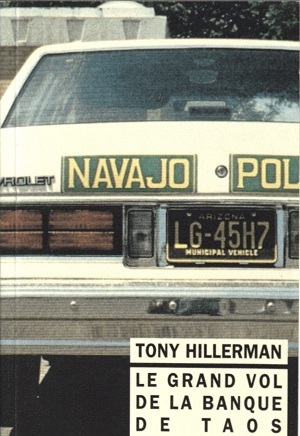 The cover art features a tinted photograph of a Navajo police vehicle which was taken by Pierre Bondil. Format: Hardback, 16.8 x 11 cm. Binding: Full-colored paper covers with title, author, and publisher printed vertically on the spine.